Poverty's No Crime was founded in 1991 by Volker Walsemann (vocals & guitars), Marco Ahrens (guitars), Christian Scheele (bass), Marcello Maniscalco (keyboards) and Andreas Tegeler (drums) in Twistringen, Germany. The first tentative musical steps were taken in their first demos. "My Favourite Delusion" and "Perfect Wings", with their first and most encouraging success coming in 1992 when they won the Newcomer Rockfestival organized by the North German radio station "FFN". Shortly after the band put their point over live to the public, as support to bands such as Depressive Age and Waltari, and took the opportunity of underlining their unusual talent. 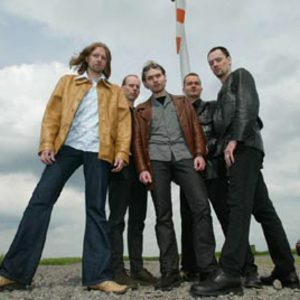 In the mid-90s the band signed for the Berlin record company Noise Records, who were known in the eighties as being the label of such German metal giants as Helloween and Gamma Ray. Their debut album, Symbiosis, recorded in the T&T-Studios in Gelsenkirchen and produced by John McGowan (Headhunter etc. ), was released in Spring 1995 and was warmly greeted by the press. "With this homogenous, deep and convincing CD debut, Poverty's No Crime have more fulfilled their inherent promise and have formed a solid foundation for their future", praised ROCK HARD, one of Germany's two mega-metal-mags. The combo then began preparation for The Autumn Years. Spring 1996 saw the release of their second album and once again the review pages of the metal press glowed with praise. This time, the ROCK HARD reviewer named the CD his Album of the month, whilst EMP, in their catalogue-mag raved, "Proggers of all shapes, color and sizes simply must buy the album of this absolutely unique band". The Autumn Years was received with positive reactions not only in Germany, but also abroad. BURRN, Japan's Heavy Metal-Bible, gave the album 88 out of 100 points and readers voted the Germany into the Top 20 of the Album Charts. The album had scarcely been released than the musicians - despite a distinct lack of suitable financial support from their record company - went on tour with Victory and followed this up with a special guest slot on the Virgin Steele/Angra-Tour which covered half of the European continent in 1996. Tremendous praise was showered on the band following their live performances in Spain, Portugal, Italy, Greece and Switzerland. Despite all this, Noise Records surprisingly ended their relationship with the band, yet the lads were more determined than ever before and gave more live shows, one of them with Skyclad. After a generous break to consolidate their ranks, the five musicians continued to follow their dream and, from January 1997, began writing songs for a new album. Poverty's No Crime found a new business (and ideological) home at Inside Out Music, currently Germany's most important Prog-Metal label, who also have such great bands as Spock's Beard, Symphony x, Vanden Plas, Platypus, Enchant and Eldritch under their contractual wing. Inside Out Music are known of signing only a certain, carefully and selected contingent of bands, whom they know they can support with great enthusiasm. In view of this, the liaison between Poverty's No Crime and Inside Out Music seems to be under a lucky star. Reviewing Slave To The Mind, the first result of this hopeful relationship, "(Hardrock & Metal) Hammer", Germany's Nr. 1 rock music magazine wrote in their August '99 edition, "This is what makes progmetal enjoyable - no long egoistic solos, no disturbing breaks, no endless I-love-me arias, but just - despite opulent decoration - straight arrangements, memorable hooks and melodic choruses... Some of the material remind me of the glorious Marillion days ("Wind And Light"), some of early Fates Warning ("The Senses Go Blind"), and yet Slave To The Mind never loses its own individual touch. A great album from a great band!" In the late 1999 Poverty's No Crime faced the first major line-up change when Marcello Maniscalco on the keyboards and bass player Christian Scheele left the band for other projects. Unimpressed by this loss, new material was written just by the remaining three musicians. However, just before entering the studio for the recordings of One In A Million the right guy for the vacant position behind the keyboards was found: J?rg Springub proved his perfect fit for the band with an impressing performance on the record. One In A Million was released in June 2001 and once again the international music press showed remarkably positive reactions. Right after the album-release bass player Heiko Spaarmann completed the line up and the combo played some successful shows together with bands like Vanden Plas, Zero Hour, Pain of Salvation and Anathema. Two years have passed since then and Poverty's No Crime took a deep breath of fresh creativity. Again they spent two month at the Soundgarten Studio and the result will hit the record stores this fall. In the end of October The Chemical ChaosTHE CHEMICAL CHAOS, the bands' fifth record will be released in Europe as well as in North America via Inside Out Music. Initial plans for a tour are already in motion, whilst winter 2003 will see the band on stage at various shows. So let's hope that the poverty in the combo's name will soon become artistic fortune.